Madame Bonnie's home office is located only 7 miles south of Los Angeles International Airport (LAX) and 18 miles southwest of downtown Los Angeles, Redondo Beach is a family-friendly beach destination, with a vibrant harbor, historic pier, international cuisine and eclectic shopping. The “Endless Pier” was built and opened in 1916 and was the precursor to what is now the Redondo Horseshoe Pier. This anomaly structure was built for about $165,000 and made mostly of concert and steel rather than wood. Sadly, within a short 20 month span, the pier was hit by storm swells that nearly destroyed it. This venture into more modern structural materials had proven not to have the give needed that wood provided. 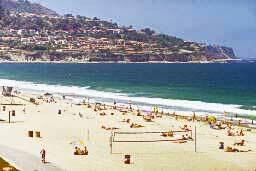 Redondo Beach provides visitors infinite opportunities to enjoy the sheer pleasures of the endless summer lifestyle. Swimming, surfing, biking, skating—the South Bay beaches are connected by a unique thoroughfare, the L.A. County Bikeway. For more information, visit the Los Angeles County Department of Beaches and Harbors website.